The following newsletter was emailed in June 2013. Any offers, specials or prices presented are no longer applicable. If you would like to be kept up to date and see current offers, please sign up for our newsletter! Comfort, style and durability are three reasons why Empire by Garden Classics® continues to be one of our most popular outdoor collections. Now in addition to bistro, high back and counter dining we are pleased to announce the addition of seating as well! Capturing the best of both high back and bistro dining our newest seating collection offers high back comfort and a combination of open and closed weave, plus it's at an exceptional value! All-weather built to last 100% outdoor UV resistant resin weave is meticulously woven by hand over all-aluminum frames that will not rust our corrode. Specifically designed to withstand the sun and storm the highly flexible, extremely strong synthetic wicker strands are engineered to endure harsh UV rays maintaining their color, texture and strength so you can be certain your furniture will stay looking lovely season after season! 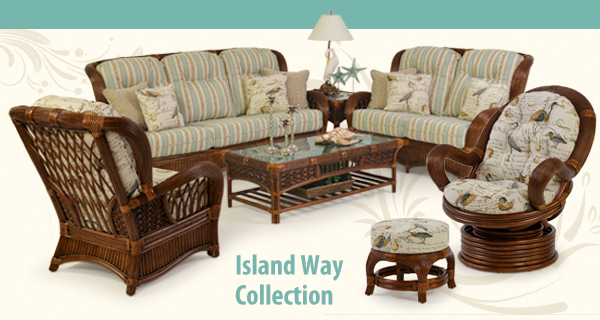 Palm Springs Rattan's® Island Way Collections gets a completely new look with updated fabrics. We decided upon a soft blue and brown, coastal inspired stripe to best show off the bold, bundle rattan on this collection. Inspired by famous painter John James Audubon and his collection of bird paintings "The Birds of America," the chair and contrasting pillows are in striking all over woven bird fabric that is exquisitely detailed. The fabric is like a page ripped out of a 1800's bird watching journal, including images of various coastal birds and eggs along with a scripted font including sighting information and migration patterns. 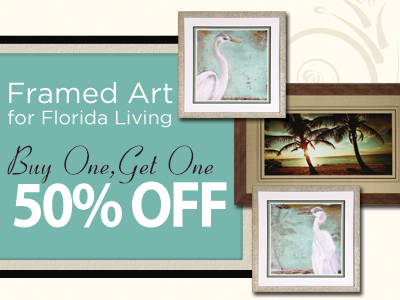 Now is the time to updated your favorite space and make a grand statement with our stylish gallery quality Framed Art at Buy One Get One 50% off! The selection featured below is from Lauren Galleries a local company in Sarasota, FL. This family owned and operated company produces Made in America framed art that is wonderfully detailed with gorgeous giclee prints, multiple matting, and unique frame finishes, such as distressed and foil leaf. Pair matching artwork side by side for a traditional look or mix and match gallery wall style for a more eclectic look. 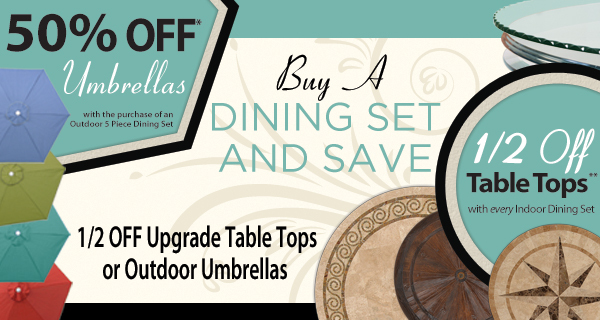 50% off Umbrellas with the purchase of an Outdoor 5 Piece Dining Set (Prior Sales Excluded. Limit 1 Discount per customer. 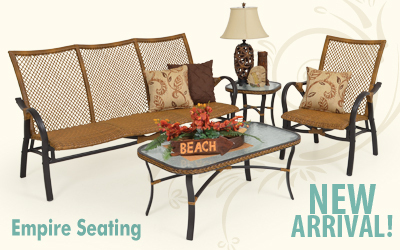 Applicable with the purchase of a full priced 5 piece or more outdoor dining, counter or best set only [see store for details]. Applicable towards stock items only. Not applicable on clearance items or in combination with other offers. Expires 6/30/13. 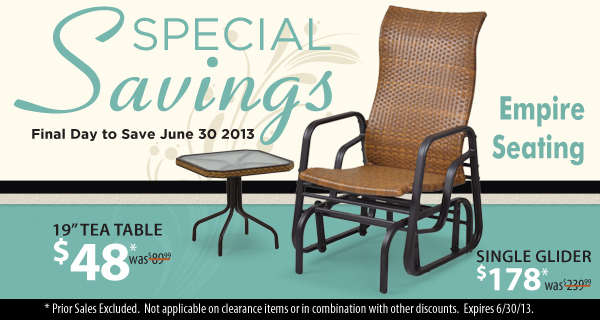 1/2 off Table Top with every Indoor Dining Set (Prior Sales Excluded. Limit 1 Discount per customer. Applicable with the purchase of a full priced dining, counter or bar set only [see stores for details]. Applicable towards in stock items only. Not applicable on clearance items or in combination with other offers. Expires 6/30/13. * Prior Sales Excluded. Not applicable on Clearance items or in combination with other discounts. Expires 6/30/13.